Summer is a time to spend outside with friends. It means big BBQs, lawn games, and probably a few four-legged furry friends who want to get in on some of the action. Unfortunately, heavy foot traffic is not ideal for a healthy sod lawn. If you plan to throw outdoor parties this summer, here are some tips on how to keep your lawn beautiful while avoiding damage to your sod. Mulch is a great space filler when summer fun ensues. It’s decorative, easy to buy in large batches, and can be spread across large areas. It’s also multi-useful, acting as a beautifier, boundary space, and safety element. Put mulch or small gravel under jungle gyms and swing sets so you don’t have to worry about bare spots forming in your lawn. If you keep large items in one place for too long, the grass underneath will become deprived of oxygen and nutrients, causing it to turn sickly yellow or brown in the shape of the object that was over it. When your lawn has large, heavy items on it, be sure to move them to a new location every other day to keep the grass beneath it from suffering. When the good times get going, your guests can easily overlook the stunning flowers you’ve spent so much time working to procure into perfect petals. It would be a shame to see someone trample on them because they didn’t realize there was a don’t-walk space directly beneath their feet. To prevent this mishap, add a decorative fence around your flower bed. This is an awesome opportunity to take your gardening creativity to a new level. This might be the perfect time to install a river rock dry creek, adding an aesthetic element to your outside space. 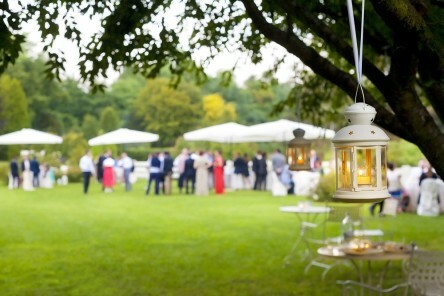 You can influence the routes your guests take when they walk on the lawn by carefully placing your patio furniture, grill, and games in a manner that necessitates minimal foot traffic on your lawn. If you have a gazebo or meeting space that’s a bit further away from your house, install stepping stones to add an appealing path that will guide your guests from here to there, while protecting the surrounding grass from incurring foot traffic. If you need extra sod to fix damaged areas on your lawn, or are looking for a brand new sod lawn, stop by Evergreen Turf and let us get you ready for your next outdoor party today! This entry was posted on Friday, July 20th, 2018 at 4:06 pm	and is filed under Arizona Sod Landscaping. You can follow any responses to this entry through the RSS 2.0 feed. Both comments and pings are currently closed.